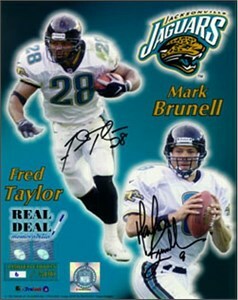 16x20 poster size photo autographed by former Jacksonville Jaguars superstars Mark Brunell and Fred Taylor. Witnessed and authenticated by Real Deal Memorabilia, with their certificate of authenticity and photo from the signings. Hand-numbered limited edition of 99. ONLY 2 LEFT.